Britain’s Queen Elizabeth II with her racing manager John Warren after her horse, Estimate, won the Gold Cup on day three of the Royal Ascot meeting at Ascot Racecourse, Berkshire. 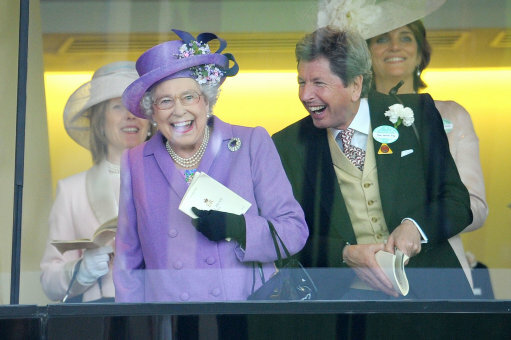 Bookmaker Paddy Power has opened the betting on what colour hat the Queen will wear at Royal Ascot on Ladies’ Day on Thursday where the feature race is the Gold Cup. Her Majesty created history in 2013 when her horse Estimate prevailed by a neck under Ryan Moore to win the Gold Cup at Royal Ascot to secure the first victory for a reigning monarch in the race that was first staged in 1807. The Queen wore a purple/pink outfit that day and Paddy Power have made this colour their favourite for this year’s betting ahead of the 2015 Royal meeting that runs from Tuesday June 16 to Saturday June 20. “Her Majesty has mostly opted for ‘pastel’ shades over the last five years and light purple and pale pink really seem to have caught Ma’am’s imagination over time,” Paddy Power said.